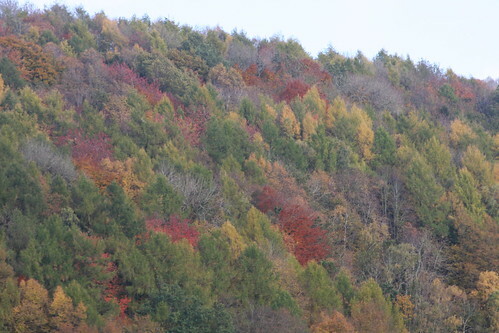 I so love Autumn. I had a load of things to do today, most of them involving someone, somebody or something, and none of them actually involving what I really wanted to do in my heart. After about three false starts, and becoming more and more wound up with interruptions – we decided to leave the building so I could get on with what had to be done with a clear mind and focused concentration. So Tintern seemed the obvious destination. Got there, to find that my painting board didn’t fit the paper, and as everything had been stashed in the boot for a month, couldn’t find anything. Then low and behold, DH (as I have been informed I should be calling him rather than B, or MasterChief) found a saw secreted in the car and promptly set about dealing with the problem. Now I ask myself – who carries a saw randomly around, and for what purpose? 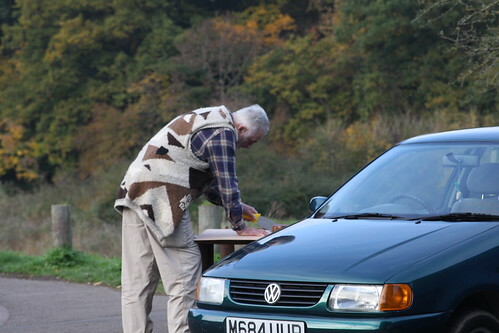 Obviously it was this..
Back to the waistcoat – Icelandic, handspun, in natural colours – with a Salish detailed pattern of some sort (I think I had seen something like the pattern in a copy of Spin Off – with eagles as well) on both fronts. If never fitted DH very well – too big, and he too thin - and was cast aside until this latest cold snap. Yesterday he was told he was “eye candy” at the checkout in Tesco’s Cullompton, so I suspect he isn’t going to be taking it off any time soon. On the bright side, at least I can find him in a crowd, but still concerned about the ease he found the saw !! What did I do this morning in between answering stupid queries, and doing re-writes from alternative perspectives. Helen very kindly commented on my blog yesterday, and I have found the link to the craftsperson she referred to: India Flint. What a fascinating site, no guessing what I am going to be doing tonight! 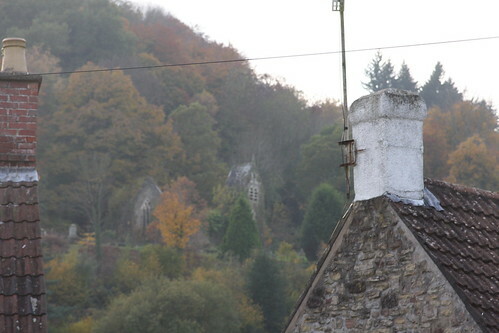 Back to Tintern – I love this little chapel buried in the hillside, visible from the car park. It looks so romantic, as I guess the Abbey did before it was cleaned back, and restored. We then spent some time travelling across the back roads and discovering all kinds of valleys, mill streams and various other delightful little grottos. I really love this time of year, and must get some marks down on paper before winter sets in, and life moves on.